The whole concept of risk vs. reward is what drives most fantasy football valuations. I can tell you to draft Jamaal Charles in the second round, but you may feel his coming off of a torn ACL (his risk) far outweighs his potential to reproduce the numbers he posted in 2010 (his reward). This idea of risk vs. reward is what helps drive individual players’ value. It’s why Aaron Rodgers is rated so highly on draft boards. It’s the reason most prefer Maurice Jones-Drew to Darren McFadden. It’s not because McFadden can’t put up better numbers than MJD. It’s because McFadden is coming off a foot injury and has more risk associated with him. Two players at the quarterback position with immense risk this season are Michael Vick and Peyton Manning. Why is Vick risky? Well, he’s played just one full season in his entire NFL career. And why is Peyton a risk? He’s a gamble because he had multiple neck surgeries and didn’t even play last year. So yeah. That’s cool. They’re both risky. Now can someone explain why Vick is being drafted, on average with standard scoring, two rounds before Manning? 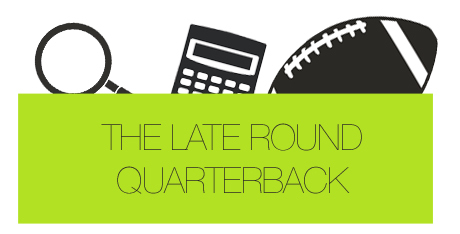 These two rounds (rounds four and five) can mean an awful lot to a fantasy team. It could be the difference between having Ahmad Bradshaw to Roy Helu as your RB2. It could also mean that you’re losing a guy like Mike Wallace for DeSean Jackson. While you may personally see little difference in those players, a two round differential within the first five or six rounds of your fantasy draft is a big deal. And it’s part of the reason why I can’t comprehend the thought of reaching for a player like Vick, especially when Peyton Manning will be available two rounds later. He’s played one full season in his entire NFL career. His passing ability has been questioned throughout his career. After his record breaking 2010 season, he failed to meet 2011 expectations. He’s coming off of four neck surgeries. He’s on a new team. He didn’t play in 2010. I understand that this list, for both players, can be longer. But to meet my objective of not boring you to death (I set my standards high), I wanted to keep it high-level. So let’s take a look at this. I’d say that the clear difference between these two players and their potential dangers is time. What do I mean? Well, look at Vick’s risk list. Clearly his are career-long. In fact, Vick has only really been fantasy elite (finishing in the top 3 at the position) three times in his career. He was 3rd in 2002, rushing for 8 touchdowns. In 2006, he ranked 2nd at the position, rushing for over 1,000 yards. And of course, in 2010, he dominated life. If we don’t count his rookie season, the year he came back from jail, and the years that he was in jail, Vick has started a grand total of 7 NFL seasons. Therefore, he’s finished as an elite quarterback 43% of his career. I think we can definitely conclude that Vick is a “go big or go home” guy. He either finishes as a high-end starter, or one that could be benched. It’s interesting, actually. His final rank almost completely depends on the amount of rushing touchdowns he scores. When he was ranked 3rd, as I’ve noted, he rushed for 8 scores. In 2010, his crazy good year, he rushed for 9. The only elite season he had where his rushing touchdown total wasn’t as high was in 2006. We can credit that to a record breaking 1,000 yard rushing season, and his only season playing in all 16 games. Looking back at the risks associated with Manning, we can conclude that these are single-season related. In other words, Peyton Manning would be ranked as an elite quarterback if he had never gotten hurt, played last year, and was still in Indy with his boy Reggie Wayne. That’s fair, right? Cool. Now, let me tell you why you shouldn’t be any more worried about his health compared to Vick’s. Before last season, Peyton Manning hadn’t missed a single game during his entire career. Vick, on the other hand, has missed 18% of his potential starts. Even if you factor in the 16 games Manning missed last season, that’s only 7% of his potential starts being missed. Vick still has him by 11%. Right now, Manning is considered to be at “90%”. If 90% means, hypothetically, that he’ll miss 10% of his season, then he’s still got better health odds than Vick. Why should we assume that Manning will not be 100% at the start of the season? He just took a year off of playing football so that he could get to 100%. And he’s close, evidently. Some are also concerned about Demaryius Thomas, Eric Decker, Jacob Tamme, Willis McGahee, and a young offensive line. It’s not as if Limas Sweed is the number one guy in Denver. Demaryius Thomas was drafted as a first rounder, and now he finally has a quarterback to help him be one. And you’re afraid of Manning’s personnel because they have a guy like Eric Decker? Peyton Manning made Brandon Stokley look like a God in Indianapolis at times. Jacob Tamme? Oh, you mean the same player that, after taking over for an injured Dallas Clark in 2010, never finished a game with less than 4 receptions? Remember who is quarterback was? The personnel shouldn’t scare anyone. It’s Peyton Manning. He, along with other elite quarterbacks like Tom Brady and Aaron Rodgers, can make anyone a solid football player and fantasy relevant. In 2010, he posted the best fantasy average points per game of any quarterback ever. He creates significant rushing statistics. Of the seasons that he does play and perform, he’s an elite talent. Aside from his rookie season, he’s never finished outside of the top 7 as a fantasy quarterback. He’s thrown for 4,000 plus yards in 83% of his seasons played, and 30 plus touchdowns in 46% of them (higher than Brady and Brees). He threw for 4700 yards and 33 touchdowns his last season played, finishing as the 4th best fantasy quarterback. If we look at Vick’s 2010 season only, then yes, we can say that Vick has a higher reward than Manning. But if we look at the way these quarterbacks have performed from a fantasy perspective throughout their careers, your higher reward is with Manning. On average over the last 7 years of his career, Manning has finished as the 3rd or 4th best fantasy quarterback. Taking away Vick’s 2003 campaign where he was hurt, the Eagles’ quarterback has finished, on average, as the 5th or 6th best quarterback. And moreover, if you remember, we said that Vick’s probability of finishing a season as an elite quarterback was 43%. Using the same credentials over the last 7 seasons of Manning’s career, we see that Peyton’s probability is 57%. Not only that, but Manning’s non-elite seasons have him as the 5th or 6th best quarterback (4th, 6th and 7th). In other words, if Manning were to finish outside of the top 3, we’d expect him to still be a 5th or 6th ranked quarterback. Vick’s non-elite seasons have him pinpointed, on average, as the 9th or 10th ranked quarterback. That’s barely startable. If we assume the risk between Manning and Vick is somewhat equivalent, then there’s no reason for us to value Vick higher than Manning. Although Peyton’s on a new team and in a new system, he’s shown that he’s consistently an elite quarterback. When you look at Vick, you can’t always say the same. We’re basing our Vick decision off of one, 12-game season. Last year, even if Vick played each game, he would’ve finished as the 7th ranked quarterback. That’s in the bottom 50% of starters. As we know, that’s something Manning has done each season played since 1999. There is a gamble associated with both of these players. But Manning is easily the better gamble. And you’re getting him two rounds after you’d get Vick.